The “driverless car” often features in the future of transport. But, sci-fi style robot cars may not be as far off as people imagine, and the first iterations could bring with them many benefits. 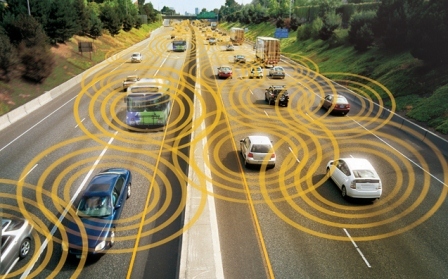 Vehicle to vehicle communications would be a major component for any driverless car and there has been a massive upsurge of interest in this area from government transport departments and engineering firms. For example the EU’s SARTRE project as reported on this blog, and government initiatives in the US. The driverless car may be far-off, but it would seem that vehicle to vehicle communications could be with us within the next decade. Vehicle to vehicle communications should make transport systems more intelligent and integrated, and give us less congested roads and reduced CO2 emissions. However, another major benefit of vehicle to vehicle communications is improved safety. The driver is still the number one reason for car accidents (according to the UK’s Royal Society for the Prevention of Accidents, Rospa). The creation of data sharing networks for vehicles on roads could support the driver in a number of ways. Vehicles in the future could use data from vehicle to vehicle communications in the next generation of safety systems and the future of transport could move on from the passive and active safety systems seen in today’s vehicles, to external safety systems. According to Consumer Reports, this could take a number of forms. For example: drivers could be alerted when approaching intersections if there is another car approaching that could cross its route through; they could stop you overtaking if there is oncoming traffic on a two lane road; they could alert you if there is a car in your blind spot and oncoming cars could provide information about accidents further up the road that you need to slow down for. The list goes on, and if the technology is incorporated into infrastructure such as traffic lights or carried by pedestrians, cars could be programmed to stop automatically at red lights or before they cause pedestrian injuries. The driverless cars of the future will look cool, but they will also be safer.